This DFT webinar discusses sizing check valves for the application and not just the line size. Sizing check valves seems easy enough; look at the line size, find one that fits and you're good to go right? Not exactly. Choosing the right check valve is critical to a properly designed process system. The right check valve not only improves overall system reliability and prevents water hammer; it lowers maintenance costs in the long term. 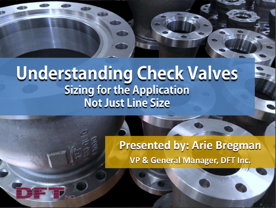 DFT's Vice President and General Manager, Arie Bregman gives an in-depth look at understanding what it takes to properly size check valves in this Understanding Check Valves Webinar.